Ideal Christmas Pressie - Slikmats! Not the first but another glowing review for veteran turntablist and all round old schooler (yes - he's even older than me) Beej and his new fangled Slikmats. Check out our Slikmats review and then visit the Slikmats site to place your order. Or point your better half to the site to get you a nice welcome pressie in time for Christmas! Wouldn`t go back to using anything else .... !!! how can it be better then rugs? if they are more stable they arnt better. Right now, my scratch skills need a lot of work. I've been out of the game for 14 years and todays techniques require a finesse I don't have right now. For that reason alone, right now slikmats suit my skill level. They are a little more forgiving of my poor technique. Can I scratch without it? I think... YESSSS! It should improve my skillz? I didn't think so. once i saw harry love doing a set, he was useing butterrugs, but befor he put them down he put some assatate slipmates down first, anyone do this. I don't think that you'r skill will be improved if u have this slikmats, sure the butter rugs are very good u really feel the difference betwen them and a normal slipmates, but i think that if u have the teknic u can enjoy skratchin' with any slipmate. scratch is an art and if u are an artist u don't pay attention to this details. but damn i cant pass up personalized mats!!!!! how long does it take for them to get done? i ordered mine last week. btw anyone want to buy some well used butter rugs? 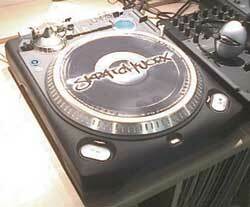 or some vestax orginals?